CLEVELAND – Carmelo Anthony doesn’t want to miss any games against his good friend LeBron James, but he might have to because of a sprained right ankle. Anthony, who suffered the injury in the third quarter of Monday’s loss to Orlando, said he feels “sore” and he’s been getting “around the clock” treatment on the ankle. 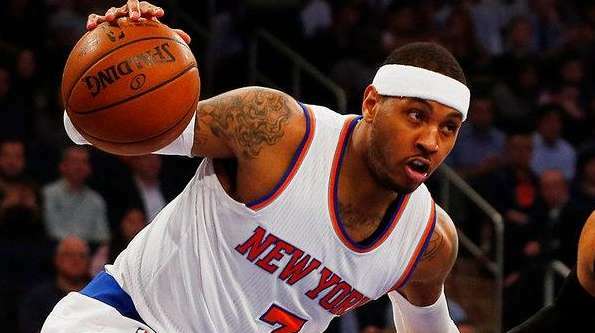 The Knicks are listing Anthony as questionable for Wednesday’s game at Cleveland. Anthony said he won’t know his status probably until game time. Anthony said it’s primarily because he enjoys playing James, and he wants to see how the Knicks, who have won four of five, stack up against the defending Eastern Conference-champion Cavaliers. But Anthony said he has to be smart and not risk missing more time. “Of course,” Anthony said when asked if the James matchup is what will make it most difficult to miss the game. “That competitive nature starts coming out. But we’ve been playing some good basketball too, so, that’s a game I probably wouldn’t want to sit out. After the Cleveland game, the Knicks have two days off before they begin a stretch of three games in four nights starting Saturday in Atlanta. Derek Fisher said if Anthony can’t play, Lance Thomas likely would start. Derrick Williams is another option, Fisher said. Kyle O’Quinn, who sat out the Orlando game, also is questionable because of a sprained right ankle. Games against the Cavaliers also are a chance for Anthony to play against old friends and teammates J.R. Smith and Iman Shumpert. It’s been nearly a year since the Knicks sent the two shooting guards to Cleveland in a three-team trade that opened up roster spots and cap space and brought back a 2019 second-round pick. The deal essentially led to Thomas, Lou Amundson and Langston Galloway joining the Knicks. Some still believe team president Phil Jackson should have received more in return, but the Knicks were desperate to move Smith. Galloway has been a regular rotation player. Thomas has elevated himself from selfless professional to an integral player and leader. He’s averaged 15.2 points off the bench in the last five games and shot 25-for-33 in that stretch, and has Anthony’s total respect. Anthony has kept in contact with Smith and Shumpert. Anthony said he texted Shumpert after hearing he helped deliver his daughter in a bathroom. Shumpert’s fiancée Teyana Taylor gave birth last week. Notes & quotes: Fisher was asked whether the organization had an issue with Williams — who had $650,000 worth of jewelry stolen from his apartment over the weekend — going out after returning home from Friday night’s win at Philadelphia when the Knicks had a game Saturday. Williams brought home two women, a New York City Police spokesperson said, and reported the grand larceny Saturday afternoon.